5-2 Bounce Back Win in Syracuse · Let's Go Amerks! After a pretty miserable 6-1 loss to the Syracuse Crunch on home ice Friday night Jack Dougherty said, “I think we’ve done a great job all year of bouncing back from particularly ugly losses so I think that’s the plan for tomorrow.” That was the plan for Saturday night and it only took 33 seconds for the Amerks to take a lead over the Crunch on the way to a 5-2 road win. This raises the question, if these two teams are able to get out of the first round of the playoffs is there really home ice advantage? In 11 games this season between Rochester and Syracuse the road team has won eight times. There’s one more game between them in the regular season next Saturday in Syracuse. Rochester now sits three points behind Syracuse for the North Division title and will have a chance to close that gap to one when they play on the road in Cleveland on Monday night. 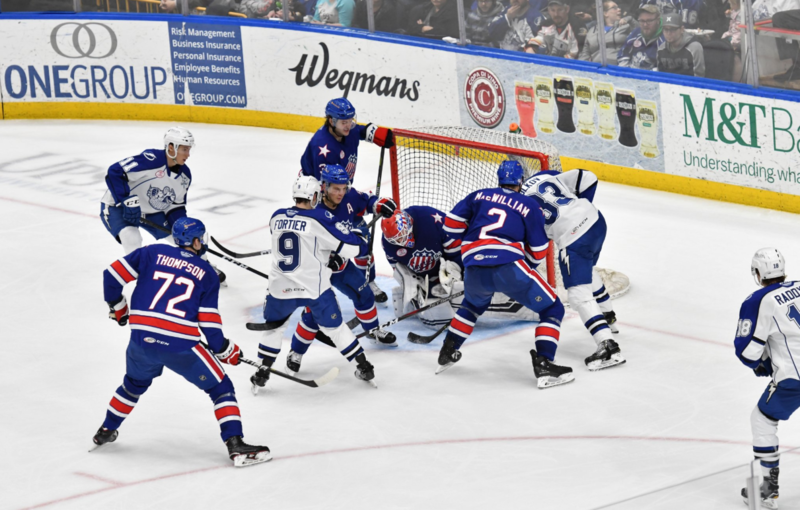 The game on Friday night was filled with turnovers by the Amerks that lead to goals against. The Crunch repaid the favor just 30 seconds into the game when Boris Katchouk made an attempt to clear the puck from along the boards to the middle of the ice. Kevin Porter was there to grab the puck, gave a quick pass to Wayne Simpson in front of the net, and Simpson scored his 20th of the season. Wayne Simpson had been snake bitten going 14 games without a goal before scoring twice Saturday. He became the sixth player to score 20 or more goals this season and the Amerks are the first team in the league this season to have six players score 20 or more. Leading goal scorers: CJ Smith (28), Victor Olofsson (27), Zach Redmond (21), Wayne Simpson (21), Taylor Leier (20), and Danny O’Regan (20). An unlikely trio put together the second goal of the game for Rochester when Andrew MacWilliam scored on a rush with assists to Dalton Smith and Tyler Randell. Yes, that really happened. MacWilliam exited the defensive zone passing the puck to Randell who carried it down the right side. A pass to Dalton Smith on the far side and then a pass to MacWilliam driving the front of the net was chipped in with a back hand. With less than two minutes to play the game had it’s first scrum after Boris Katchouk took a charge at Kevin Porter on the boards. Moments prior Porter was hit from behind on the boards but it wasn’t called. Syracuse had a short handed scoring opportunity that was stopped by Tage Thompson back checking and deflecting the puck into the corner. At the end of the first period the Amerks were up 2-0 and also had a 15-3 lead in shots. As one power play ended for Rochester early in the second period they were given another when Brady Brassart took a run at Will Borgen in the corner and was sent to the box for elbowing. Yannick Veilleux became the next unlikely goal scorer slapping in a rebound in front of the net on the power play at 2:05 of the second period. That would turn out to be the game winning goal and also gave the Amerks a 3-0 lead. Taylor Leier had taken the initial shot off a pass from Rasmus Asplund. They both earned assists. Offensive threats like Victor Olofsson and Danny O’Regan were missed on Friday night and no one else was able to step up. Saturday night was different with Yannick Veilleux and Andrew MacWilliam finding the back of the net. Just under two minutes later CJ Smith took a shot from the point off a pass from Zach Redmond and scored his 28th goal of the season. It was originally credited to Tage Thompson but he immediately pointed to CJ Smith. Nolan Valleau of the Crunch argued it went in off a high stick but the replay seemed to indicate it went in off Valleau. Wayne Simpson made it look easy again when he scored to put the Amerks up 5-0 at 11:22 of the second period. Rasmus Asplund controlled possession on the boards and setup Brandon Hickey for a shot. Tolvanen made the initial save but landed the rebound right in front of Simpson. Alex Barre-Boulet scored late in the second and Dennis Yan scored at 5:54 of the third to make Syracuse think they had a chance of winning but it wasn’t going to happen. Rochester did appear to start playing on their heels a little bit but there was one difference compared to Friday night – there weren’t any repetitive turnovers. Adam Wilcox had to thank his goal posts at least three times in the game and finished with 15 saves in the win. Rochester finished the game with a 35-17 advantage in shots. The difference between Friday and Saturday for Rochester was less turnovers, better puck control, and scoring a power play goal. Hockey 101. Kurt Gosselin and Casey Fitzgerald were replaced by Arvin Atwal and Brandon Hickey on defense. Sean Malone was scratched for Tyler Randell. Zach Redmond had an assist and reached the 50 point mark for the first time in his career. He now has 21G+21A in 55 games played. Tage Thompson left the game early after blocking a shot off the high shin/knee area. He left the building walking normal. Matt Tennyson was assigned back to Rochester halfway through the game and is expected to join the team in Cleveland. The status of Victor Olofsson, Lawrence Pilut, and Alex Nylander is still unknown as of writing this. The fact that they weren’t assigned after the game is a questionable sign that they may not be returned for the game Monday. Danny O’Regan did not play again but in a good sign he is on the road trip with the team.